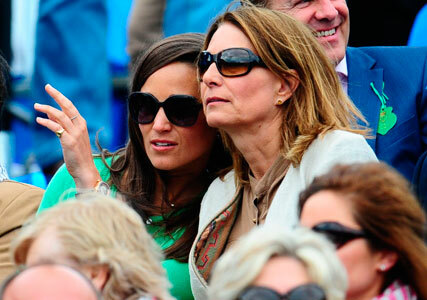 Pippa Middleton managed to steal the spotlight away from her royal sister yesterday, by rocking up to the AEGON tennis tournament in London with her mum Carole. While the heavily-pregnant Duchess of Cambridge christened the Royal Princess cruise liner in Southampton wearing a £169 Hobbs dalmation print coat, Pippa rocked a low-key bright green knitted dress and cardigan from Cashmere by Tania, and looked stunning as she sat with her mum during the match. She teamed her outfit with a black and green bag from Bally and gold and amethyst drop earrings from Davina Combe Jewellery. The socialite’s boyfriend Nico Jackson was nowhere to be seen, and instead Pippa took her mum Carole along to watch Andy Murray on the court. Excited spectators took to Twitter to announce Pippa‘s arrival, and all eyes were on Kate Middleton‘s little sister as she clapped and giggled her way through the game at the Queen’s Club in London. Pippa, who’s a regular at Wimbledon, recently wrote a guide to tennis season in a column for Vanity Fair magazine. The 29-year-old revealed how she once queued from the early hours with her famous sister to try and secure tickets for Centre Court. Kevin Spacey was also at the match yesterday, but almost went unnoticed once Pippa and Carole arrived.